In his earlier video article "Better Movements" (Oct 2007 CrossFit Journal) Coach Glassman explained that high power functional movements such as the jerk and the kipping pull-up are better exercises--in several critical ways--than their simpler relatives, the press and the strict pull-up. In "Productive Application of Force" (Jan 2008) he explained why our definition of strength is not equivalent to just muscular contractile force. What really matters is the ability to apply that muscular force to do real physical work, which cannot be independent of the skills and mechanics of functional movement. In this month's video, Glassman elaborates further on the relationship between technique and functional movement, power, and fitness. Technique, he explains--like its cousins mechanics, form, and style--is not at odds with intensity but is in fact essential to maximizing power and thus fitness. Proper technique is the mechanism by which potential human energy and strength are translated into real work capacity. Part 2, next month, will be Q & A, mostly A. Simple question: What is CrossFit? 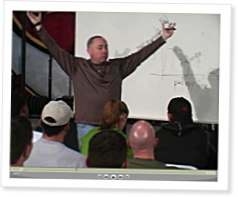 The Technique Lecture may be my favorite lecture and overall concept in CrossFit. Excellent stuff. I CAN'T FIND PART 2 OF THIS WONDERFUL LECTURE, WHERE IS IT? HEY, DO YOU HAVE ANY OF THIS IN SPANISH OR FROM SOME OTHER COURSES IN SPANISH ? THAT WOULD BE VERY HELPFULL CONSIDERING THE INTERNATIONAL REACH THAT CROSSFIT HAS ALL OVER THE WORLD !!!!! SORRY ABOUT THAT GRAMMAR MISTAKE, THE INTERNATIONAL REACH THAT CROSSFIT HAVE ALL OVER THE WORLD ! !